The Queen Mother gave King Mswati III, the absolute monarch of Swaziland / Eswatini, a dining room suite made of gold for his 50th birthday. It will go alongside a lounge suite trimmed with gold that he was given by senior members of his government. 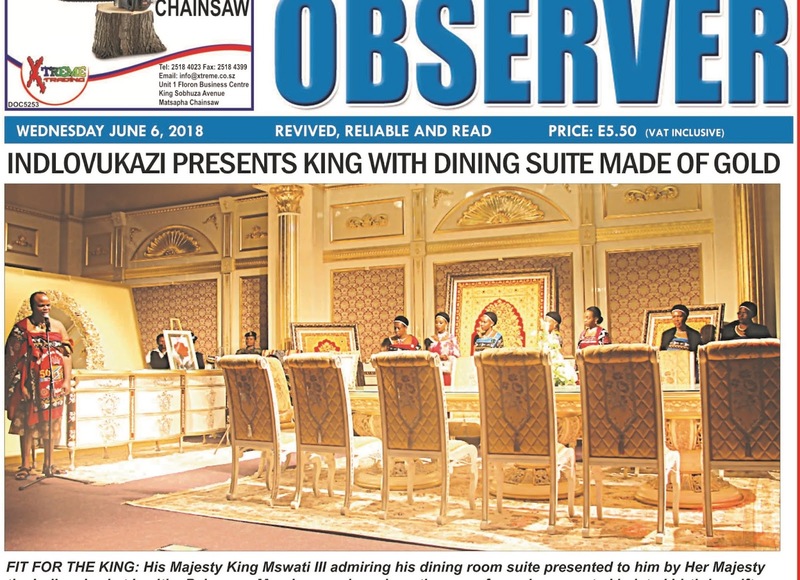 The Swazi Observer, a newspaper in effect owned by the King, reported for the second day running on Wednesday (6 June 2018) that many of the King’s subjects visited him at Lozitha Palace. It reported that the handing over of gifts took six hours to complete. The King has 13 palaces in impoverished Swaziland. He also owns two private jets and fleets of top-of-the range Mercedes and BMW cars. His family regularly travel the world on shopping trips spending millions of dollars each time. The newspaper reported that more than E15 million had been given to pay for the so-called 50-50 Celebration that marked the King’s 50th birthday and the 50th anniversary of Swaziland’s Independence from Great Britain. At least E1.6 million came from public funds. The Royal Eswatini (Swaziland) Police Service and Correctional Service gave E300,000 each and the Public Service Pension Fund gave E1 million. The Observer reported King Mswati was in ‘a jovial mood as he received the gifts’.